DENVER, Colorado, May 4, 2012 (ENS) – An agreement to establish the Rocky Mountain Greenway Project, linking trails and transportation systems with national wildlife refuges and Rocky Mountain National Park, was signed today at the Rocky Mountain Arsenal National Wildlife Refuge. Two areas now designated as refuges that once were covered with chemical and nuclear weapons factories will become part of the Rocky Mountain Greenway. Secretary of the Interior Ken Salazar and Colorado Governor John Hickenlooper signed the agreement establishes a 10-person steering committee to implement conservation and recreation projects throughout the Denver and Front Range metropolitan area. “The Denver and Front Range metropolitan Area is already rich with a strong system of trails, parks and open spaces, but we can do more. If we think beyond our fences, leverage our resources and align our visions, we can make this America’s next great urban park,” said Salazar, a former U.S. senator representing Colorado. The federal, state, local and stakeholder partnership aims to link the three National Wildlife Refuges in the Denver metro region with Rocky Mountain National Park. It will connect hundreds of miles of trails, parks, and open spaces along the South Platte River and its tributaries throughout the Denver/Front Range metropolitan area. The project will encompass two national wildlife refuges contaminated with the remains of more than 50 years of nuclear and chemical weapons production. The Rocky Mountain Arsenal National Wildlife Refuge, covering 27 square miles between the Denver International Airport and downtown Denver, was used by the U.S. Army as a chemical weapons manufacturing facility called the Rocky Mountain Arsenal following the 1941 Japanese attack on Pearl Harbor that brought the United States into World War II. As production declined at war’s end, some of the idle facilities were leased to Shell Chemical Co. for the production of agricultural chemicals. The Arsenal was later used for Cold War weapons production. Closed in 1992, much of the site has been remediated, but parts of it are still listed as a Superfund hazardous waste site, according to the U.S. Environmental Protection Agency. The Rocky Mountain Arsenal is now one of the largest urban national wildlife refuges in the nation. 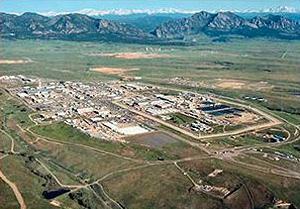 The 6,200 acre Rocky Flats National Wildlife Refuge in the Rocky Mountain foothills between Denver and Boulder was the site of a federal government facility producing plutonium triggers for nuclear warheads from 1952 through 1992, when it was shut down because of safety concerns and the end of the Cold War. Tons of highly radioactive plutonium from Rocky Flats were shipped to the Savannah River Site in South Carolina and tons more transuranic waste was shipped to a storage site in New Mexico. 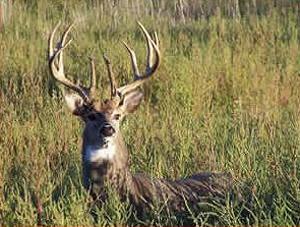 The Rocky Flats National Wildlife Refuge Act was passed in 2001 and site cleanup was declared complete in 2005. 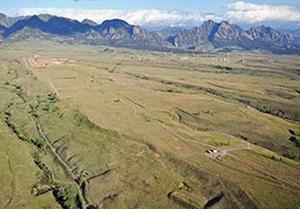 However, Rocky Flats remains on the Superfund list of the nation’s most hazardous waste sites. About 1,000 acres of the new wildlife refuge, the former industrial area, will remain under Department of Energy control for ongoing environmental monitoring and remediation. The Rocky Mountain Greenway will also link to the Two Ponds National Wildlife Refuge in Arvada, Colorado, one of the smallest refuges in the system. It will connect to Rocky Mountain National Park, the sixth-most visited park in the nation with over 3.1 million visitors per year. Today’s signing ceremony followed a meeting on the initiative’s progress with Senator Mark Udall, Congressman Ed Perlmutter, Denver Mayor Michael Hancock and other elected officials, local and regional planners, and open space leaders throughout the metropolitan area. They all emphasized the positive economic aspects of the Greenway without a word about the contaminants remaining at Rocky Flats and Rocky Mountain Arsenal Superfund sites. “Outdoor recreation is a tremendous boost to the state, contributing over $10 billion a year to our economy, supporting over 100,000 Colorado jobs and generating $500 million in state tax revenue,” said Senator Udall.